High Times Again in Singapore? Singapore, once revered for its seem- ingly insurmountable edge in the ship repair and conversion business, has fall en on harder times in recent years. The forces which have slowed the area's break-neck pace of expansion and dom- inance are not at all unfamiliar to ship- builders and repairers in the U.S. and Europe: rising land and labor costs, cor- porate consolidations and a seemingly endless stream of cut-rate competitors, According to recent financial reports from the area, though, it appears that Singapore's two ship repair yards, Keppel Hitachi Zosen Ltd. and SembCorp Marine Ltd., have found the balance to reign supreme once again. The companies were expected to report modest profit growth after almost two years of restructuring and consolidation. Keppel Hitachi Zosen was expected to turn in profit of about $19.4 million for 1999 after a $38.3 million loss for the nine months ended December 1998, analysts said. SembCorp Marine was expected to post a 10 percent rise in earnings of between $46.03 million and $47.2 million against 1998 profit of $42.3 million. Squeezed by rising land and wage costs. Singapore's shipyard industry underwent a consolidation in 1997 and 1998 that saw the city state's main players reduced to two from four. SembCorp Marine was formed by a merger between Jurong and Sembawang Shipyards in mid-1997 while Keppel Shipyard and Hitachi Zosen (Singapore) completed their merger in 1999. 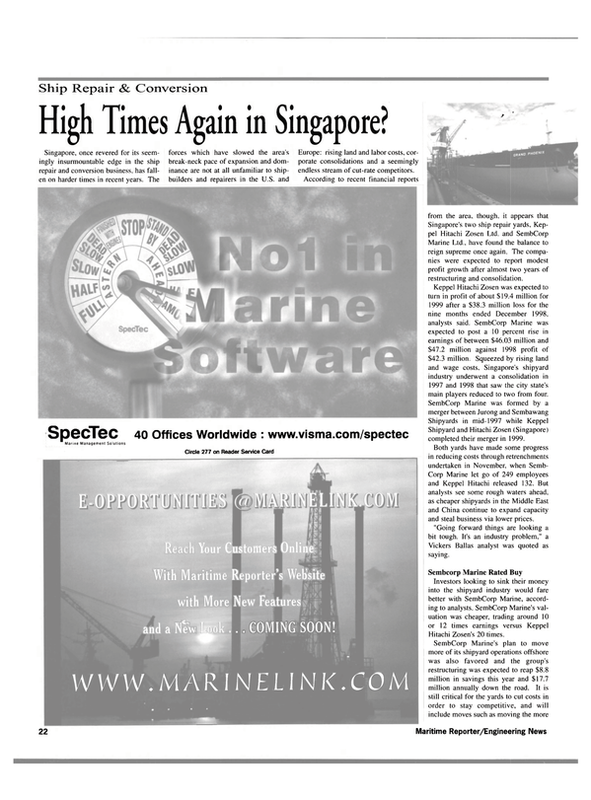 Both yards have made some progress in reducing costs through retrenchments undertaken in November, when Semb- Corp Marine let go of 249 employees and Keppel Hitachi released 132. But analysts see some rough waters ahead, as cheaper shipyards in the Middle East and China continue to expand capacity and steal business via lower prices. "Going forward things are looking a bit tough. It's an industry problem," a Vickers Ballas analyst was quoted as saying. Sembcorp Marine Rated Buy Investors looking to sink their money into the shipyard industry would fare better with SembCorp Marine, according to analysts. SembCorp Marine's valuation was cheaper, trading around 10 or 12 times earnings versus Keppel Hitachi Zosen's 20 times. SembCorp Marine's plan to move more of its shipyard operations offshore was also favored and the group's restructuring was expected to reap $8.8 million in savings this year and $17.7 million annually down the road. It is still critical for the yards to cut costs in order to stay competitive, and will include moves such as moving the more labor-intensive portions of the operation offshore. At press time, there were even rumors afloat that the consolidation process among Singapore repair and conversion yards is not yet done. Keppel Hitachi had not fully reaped cost savings from its merger though some progress had been made through retrenchments. Analysts generally expect that earnings to decline for year 2000. Unlike SembCorp Marine, the bulk of Keppel Hitachi's turnover comes from ship-repair, and thus the yard would not benefit from a rebound in conversion activity.